What a wet week it has been, such a shame for all the children still off school. 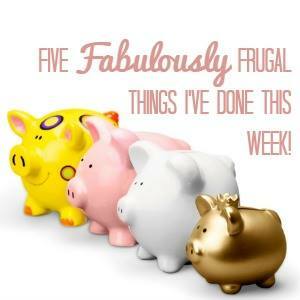 This week I have managed to be a little frugal but it is always so hard when the children are off school and need entertaining. Linked to the kids being off! Tesco have had 25% off their wines if you bought six or more. I took them up on their generous offer with my favourite Yellow Tail Pinot! I have written this week about unlocking the potential in your home which for some would provide them with more financial freedom. Dylan needed some new jeans this week and therefore we headed to town to get them. Thankfully Chloe was with us and we were able to use her Unidays discount to save 10%. Every bit helps, especially in the school holidays! Finally to keep Erin entertained in this rainy weather we have been crafting and doing experiments. We have been making Paper Poppies which were super simple and very pretty. Erin used hers to make a card – I think it could be my own birthday card which is on Sunday! We have also been looking at my lovely friend Emma’s new book This Is Rocket Science. It is brilliant for kids with an interest in STEM. I have the Wuntu app from Three but have never ‘won’ anything. Have you seen them advertising 100 free flights now? I’ll keep looking out and hopefully, I’ll get lucky soon. Thanks for letting us link up again.